“A rose by any other name, would smell as sweet.” ………. William Shakespeare. I would answer: Not necessarily, at least when it comes to a rose wine. Rose wine is made worldwide. France garnished attention with rose wines made in Tavel and the Province, but Spain, Italy and other countries have been making rose wines for as long as hot weather has directed a preference for dry but lighter bodied wines. Grenache, syrah, cabernet franc, pinot noir, sangiovese, gamay and so many other grapes are used in the making of rose, one wonders if the simple moniker of “rose” on a label is sufficient disclosure. And rose is also one of the food friendliest wines you could want; and chilled, it’s excellent by itself as a summer refresher outdoors. So given all this flexibility, why isn’t rose more popular in the U.S.? I think there are three reasons: First, it’s cultural. 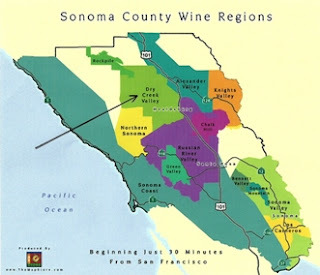 While much of Western Europe thinks “wine,” in the U.S. we think “red” or white” and rose is left somewhere in never land. People feel comfortable telling you they like “red wine” or “white wine” and this cultural pigeon holing eliminates the joy of experiencing the world of wine. Second, the damaged image of plop from a few decades ago still lingers through recalling and retelling. The U.S. was awash in a sea of cheap, characterless rose, much of it imported. Having tasted some of those wines, my impression was that it was “wanna be” wine. It wanted to be like a red, but lacked body. It wanted to be like a white, but it lacked crispness. What it was, was thin, flat and without character. Finally, some thought prejudices continue to exist: one being that rose is a woman’s wine. Maybe this is related to the first reason. Indeed, while U.S. retail sales of rose wine increased 22% in the period of 2009 – 2011, further investigation reveals that most of that increase is attributable to women. Perhaps they know something we men don’t. I recently enjoyed a rose made (80%) from Zinfandel and (20%) Petite Syrah. Appropriately, it is called “Petite Zin” Rose of Zinfandel. 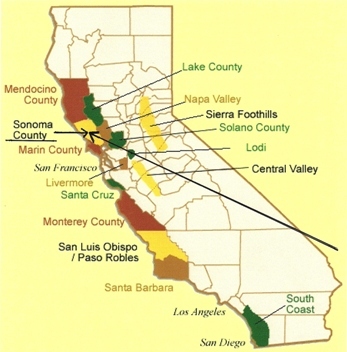 It’s made by Dry Creek Vineyard in Sonoma Valley and grapes come from the Dry Creek Valley AVA (see map). This wine offers a sweet impression of fruitiness, but is dry and fresh. Deeper in color than most French and Spanish roses, it offers medium body and a good mouthfeel. The nose is ripe strawberry with hints toward cherry. Serve this wine well chilled, but after your first tasty sip, allow the wine to warm in the glass slightly and pick up subtle tastes of clove, cinnamon and – of course – pepper that is so typical of zinfandel, though more subtle in rose than in the red wine. Throughout the nose and tasting, floral senses disclose themselves and add to a wonderfully soft but enjoyably fresh and quenching finish. 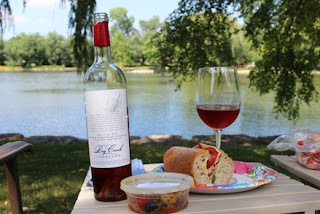 This is a wine for summer, for outdoors, to enjoy aboard when the boat is docked, on the patio or deck or picnic, or to simply celebrate any moment of carefree living. Zinfandel is “America’s grape” and this rose reflects what the family owned winery of Dry Creek Vineyard has done with this grape during their forty years of winemaking experience. As I continue to experience wines from this Sonoma Valley winery, I continue to be impressed by the price/ quality ratio of their offerings. If you’ve not tried rose wine, or found it either boring or too sweet in the past, you owe it to yourself to give this rose a chance. A rose by any other name wouldn’t be the same as this from Dry Creek.